So, here we go again. With 10 years of training seasons under our belt, its time to start the next 10 years. Unfortunately we won’t be starting as we normally do. First, I won’t be here for the first 4 weeks ago. My good friends Lois, Alicia, and Courtney have volunteered to keep things on track while I’m away. The second thing making things difficult is that Brueggers, our host for the past 10 years, is closing for renovations in January into February. This poses quite an issue with our planning. The solution… still working on that. I’ve been working with Mike Quigley to get us access to the Knights of Columbus on Sunday mornings at 8AM so we can start the run from there. After the run, the only sizable coffee shop in the neighborhood to meet up for a coffee is Dunkin Donuts down the street. So that’s the plan for the month of January, unless you hear otherwise. As for the run, we’ll start with Week 0, the pre-run of the official 15 week training program. Week 0 exists because the number of weeks between New Years and Patriots Day is not the same every year. 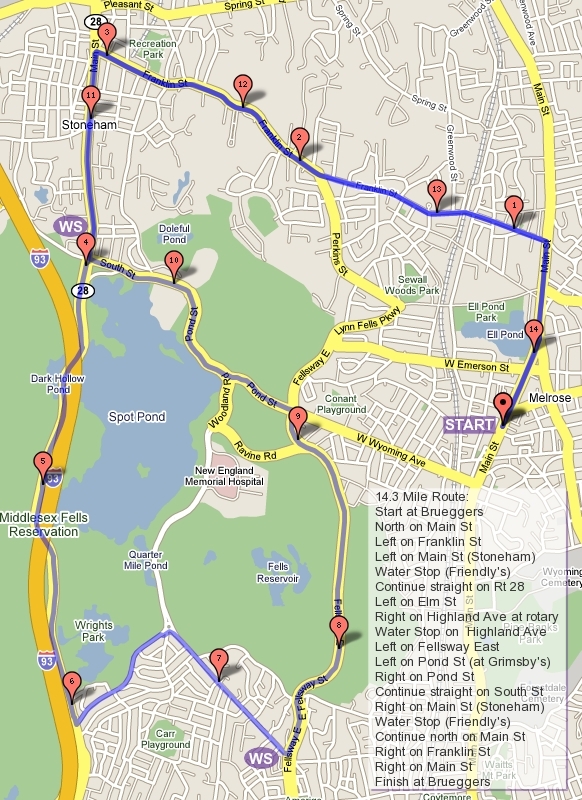 The run is about 8.8 miles for the long runners and 4.2 for the shorter route. We’ll head up Main Street, go right onto Green Street by the Melrose/Wakefield Hospital, and turn right on the LynnFells Parkway. After about a mile you’ll come to the first set of lights on the LynnFells and turn left onto Main Street in Saugus. If you’re running short, turn left on Howard and follow it back to a left at Green Street. Green will take you back to Main to Melrose Center. If you’re going long you’ll continue along Main Street, which will become Farm Street in Wakefield. Watch for a water stop at Wakefield High School. After the stop continue to the end of Farm Street and turn left at the lights onto Water Street. Run along Water Street until you get to Main Street in Wakefield Center. Turn left onto Main and follow that all the way back to Melrose Center. For those that haven’t run with us before, the run takes of sharply at 8AM. Cost for the run is $1 for the short run, $2 for the long run. This fee is used to build up the water stop supplies throughout the season. Lois, Alicia, and Courtney will help coordinate water stops. We’ll need volunteers each week to set up water stops. Keep your eyes on this blog to see the plans, the maps (click the distance in the plan on the right side of this page for a map), and any weather or party related schedule changes. Also, I ask you to reply to the roll call each week so we know how many runners to plan on for water stops. If you don’t answer, we may not have enough supplies to get you through all the miles. Any questions? If so, just ask! Otherwise, its time for the Roll Call: who’s in? !